Boise State football: Is it habit—or true future forecast? Every time Boise State appears to be in danger of a rebuild, there are national media who just don’t buy it. The Broncos are not out of the preseason New Year’s Six conversation just yet. BOISE, Idaho — Thursday, March 21, 2019. Some things never change. To this day, Boise State gets the benefit of the doubt from national college football sites. Next season, the top Group of 5 team will face the highest-ranked at-large New Year’s Six selection in the Cotton Bowl. CollegeFootballNews.com has the Broncos facing Texas A&M at AT&T Stadium in Dallas on December 28. That would be an ironic followup to the aborted First Responder Bowl in the old Cotton Bowl Stadium last December. It’s also been widely reported that BetOnline’s initial spread has Boise State over Florida State 4.5 points on August 31 in Jacksonville. Are these just turnkey projections based on the Boise State brand that has been built over the past 20 years? Is it blind faith that the Broncos will replace Brett Rypien with a star in the making—and maintain on defense despite major coaching changes? 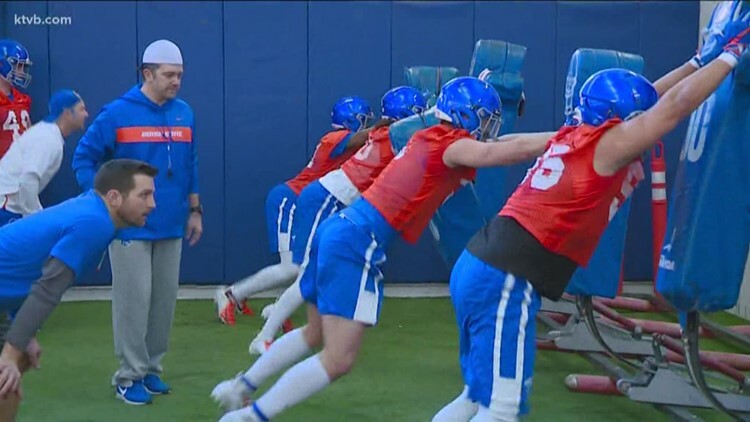 Did Boise State’s 2019 recruiting class rub off on them? And have they been reading up on Hank Bachmeier and the strong early impressions he’s made in spring football? These are not rookies putin this stuff out there. In the case of the Cotton Bowl prediction, it came from veteran writer Pete Fiutak. And the Broncos would take either scenario in a blue turf minute. There’s not a lot to go by in figuring the Boise State women’s chances at an upset in their first-round NCAA Tournament matchup at Oregon State Saturday. After the NCAA committee’s seeding of the Broncos produced one of the biggest rips in recent memory, they’re faced with playing a tournament game on an opponent’s home floor again as a No. 13 seed. Destiny Slocum or nor Destiny Slocum, this OSU team is really good. This will be the 15th meeting between Boise State and Oregon State, but the first since 2000. The Beavers lead the series 9-5 but the Broncos are 2-0 versus OSU in postseason play. Remember the AIAW, the Association for Intercollegiate Athletics for Women? Boise State beat the Beavers in the AIAW Region IX playoffs in 1974 and 1975. I always wondered where Malek Harwell’s Boise State career would have gone had he not torn his ACL at the very beginning. That put the former Idaho Player of the Year from Pocatello’s Century High behind the eight-ball, and his chances of emerging as a senior were slim considering classmates Justinian Jessup, Alex Hobbs and Marcus Dickinson were also slated to return at guard. So you can’t blame Harwell for going the graduate transfer route for his final year. Kudos to coach Leon Rice and his Bronco staff for helping him find a solid landing spot. Might it be in the Big Sky? Harwell finished his Boise State stint with 99 points in 57 games. WHAT DOES NEVADA HAVE IN THE TANK? Oh ye of little faith. “Ye” being national pundits. Nevada is a No. 7 seed facing a No. 10, Florida, and is a two-point favorite this evening in the NCAA Tournament. But the Gators are a trendy pick on brackets around the country. Many see the Wolf Pack as worn down after absorbing its Mountain West semifinal loss to San Diego State and losing three of its last eight games. The Aztecs slowed the game down, getting the Pack out of rhythm, and Florida plays the same way. The Gators are the battle-tested team, having faced the 18th-most difficult schedule in the country. Nevada’s slate was rated No. 111. The Wolf Pack doesn’t have that Sweet 16 look it had a year ago. The Mountain West’s other Big Dancer, Utah State, faces Washington Friday night in Columbus, OH. Former Borah High star Isaiah Wright’s college career is over after San Diego’s 74-60 loss to Memphis in the NIT Tuesday night. In two years with the Toreros and two previous seasons at Utah, Wright played 127 career games, averaging 7.9 points and 3.4 assists. He scored seven points in his finale versus the Tigers. There’s only one Idaho tie in the men’s NCAA Tournament, and you’ll only see him in sweats. Boise High grad Paul Pennington is redshirting this season for Gonzaga, who faces Fairleigh-Dickinson tonight in Salt Lake City. Free agent Jay Ajayi is still on the market. The former Boise State star met with the Indianapolis Colts Wednesday, but there was no deal struck. Ajayi, late of the Philadelphia Eagles, could still land with the Colts, but it seems most NFL teams want to know where his torn ACL will be once training camp rolls around. He was injured in Week 7 last October and finished the season with just 184 yards and three touchdowns on 45 carries. Tyrone Crawford has established himself as a defensive leader in Dallas, but today the former Boise State star is in the news for different reasons. Video surfaced on TMZ showing Crawford fighting with the security staff at the Coyote Ugly Saloon in Panama Beach, FL, around midnight last Friday. The NFL is looking into the incident—Crawford has not been arrested or charged, but there are allegations that he shoved multiple police officers. An off-duty policeman working at the bar said both the bar patrons and security were at fault. Crawford is coming off his sixth NFL season with 22 career sacks and three fumble recoveries. Boise State returns to the NCAA Tournament for the first time in 14 years and faces No. 3 seed Louisville in the East Regional at Birmingham. It was a game effort by the senior-laden WAC champions, but the Cardinals jumped out early with pressure defense and a hot hand on offense. BSU was 4-of-17 from three-point range, and UL was 12-of-24, as coach Rick Pitino made that a focal point of his attack at both ends of the floor for this game. That spelled the difference in a 79-61 Louisville victory. Matt Nelson led the Broncos with 17 points and seven rebounds in his final game.